Project audits are imperative to assess the progress of a project. Regular audit sessions ensure that a project’s management is in-sync with the established project objectives. The project audit provides an opportunity to uncover the issues, concerns and challenges encountered in the execution of a project. It affords the project manager, project sponsor and project team an interim view of what has gone well and what needs to be improved with the project to successfully complete it. If done at the close of a project, a project audit can be used to develop success criteria for future projects by providing a forensic review. This review will provide an opportunity to learn what elements of the project were successfully managed and which ones presented some challenges. This will help the organization identify what it needs to do so that mistakes are not repeated on future projects. The Project audit focuses on whether effective project management processes are being utilized and whether the project appears to be on-track. A project audit explores the processes used to manage the project and build deliverables as well as the status of the project relative to the defined objectives..
Our Project Audits follow a basic process audit format. However, our staff will take your organizations unique characteristics into consideration in the findings and steps during audit. Our report will be tailored to your unique situation. The auditor would request relevant project documentation up-front, such as schedules, budgets, risk analysis, etc.. The auditor might also ask the project manager to be prepared to discuss certain aspects of the project. This ensures that the actual meeting time is as productive as possible. If the project is large or complex, the auditor will need to meet with the project manager, team members, clients and other stakeholders to asks the appropriate questions to verify project status and processes. The auditor documents the status and the processes used on this project against best practices. 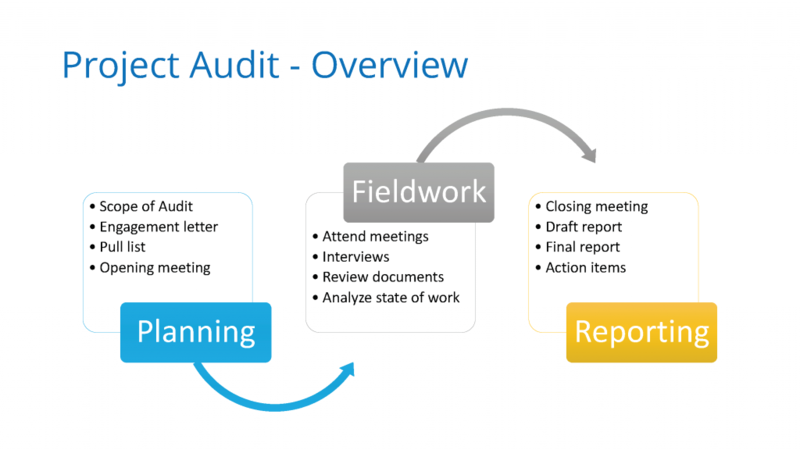 If the organization has standards and policies in place for managing projects, the auditor determines whether any of these are not being followed. The auditor also makes recommendations on things that can be done to provide more effective and proactive management of the project. The auditor and the project manager meet to review the initial findings. This auditor describes any project management deficiencies and recommendations for changes. This review provides an opportunity for the project manager to provide a rebuttal when necessary. The initial audit findings might be modified based on specific feedback from the project manager. The auditor issues a final report of findings and recommendations. The project manager may also issue a formal response to the audit. In the formal response, the project manager can accept points and discuss plans to implement them. The project manager may also voice his disagreement with certain audit points, and explain his reason why. In these cases, the project sponsor and the project director (manager of the project manager) will need to decide if the project manager should comply with the recommendations or not.